COIL is a cross-discipline research and development center directed toward transforming learning through online innovations. Programs, services and lessons learned will be shared. 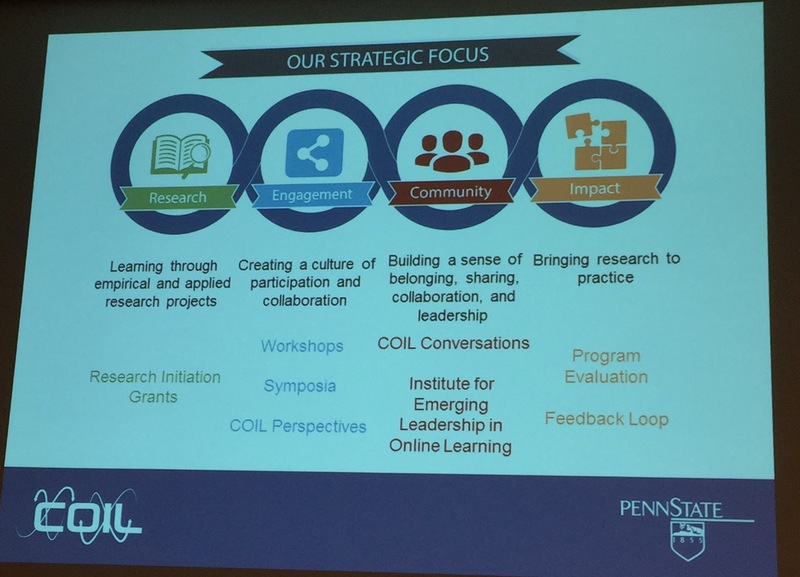 In 2012, Penn State created the Center for Online Innovation in Learning (COIL) with the mission to engage the University’s extensive research enterprise to improve online learning at and beyond Penn State. Building upon over 100 years in distance education and over 15 years of leadership in online education via Penn State’s World Campus initiative, COIL is a cross-discipline research and development center sponsored and supported by colleges and departments spanning the University. The core mission of COIL was intended to guide the transformation of teaching and learning processes by supporting researchers who want to investigate, invent, and implement technologically enhanced online innovations. Over the past three years, COIL has developed and refined a model to engage diverse constituent groups including faculty, staff and students in conducting first-hand research around a variety of online innovations. Built around COIL’s Research Initiation Grant (RIG) program, this model has led to significant achievements in improving learning at Penn State and beyond and has contributed to the development and nurturing of a community-driven culture of research and development. Additional programs aimed to generate dialog and a culture of innovation will be shared. This session will highlight the COIL initiatives, services, and programs designed to support and improve the success of learners via online innovations. The COIL Research Initiation Grant program including the process, products, outcomes, and related insights will be shared. It will also include discussion and activities intended to contextualize the COIL model for participants and to identify potential for cross-institution collaborations. Goal: Lead and create a conversation and culture of innovation at the university. Innovative ideas sprouting up around the university, but they didn’t really continue beyond one semester. There wasn’t the support or facilitating the ideas to scale across the university. What new or emerging technologies are available? Assist in solving problems (BYOP) and collaborate to align resources across the university. Challenges = Determining a Focus, Need to Show Impact, Being Visible, Overlapping goals and missions/situated in a large diverse, distributed institution (aka “turf”) > try to work with these other areas as partners. Moving outside the echo chamber and competing interests. Proof of impact and evaluation. Speaker: Jon Kolko, Vice President of Design, Blackboard Inc. Most companies consider strong product management to be the “glue” that holds together products as they are being conceived of and built, and most companies treat product management as either a marketing or an engineering activity. But modern startups like Airbnb and large corporations like JetBlue or Starbucks have proven that industry disruption is possible not by focusing on adding features or just improving sales, but instead by focusing on providing deep, meaningful engagement to the people that use the products or services. This engagement is achieved by designing products that seem as though they have a personality, or even a soul. These products feel less like manufactured artefacts and more like good friends. Design doesn’t refer only to aesthetics or usability, although these are things consumers are most likely to notice or appreciate. Design is both a noun and a verb. It can mean the visual or tactical quality of a product, as well as the process by which products are conceived. Design is a more comprehensive way of thinking about people and human behavior than engineering or marketing. It is a product development process that uses empathy with a community of potential consumers in order to identify problems to solve. Design leverages a certain way of thinking in order to infer solutions to those problems that will have meaningful emotional appeal, and a strong market fit. Where do great new products come from? Is it vision? For AirBNB they generally have a North Star that they are all headed towards. Is it process? For Foursquare there really aren’t a lot of examples of people who have gone through the entire process… at the speed of startups the process is fragile. Is it just hard work? For CEO Are you watching this? I love what I do. I went four years without making a single dollar without a single customer… it’s a passion! Innovation – Is it new? Is it exciting? Does it have the potential to disrupt? Positioning – Is it competitive? Is it differentiated? Is there a market opportunity? Engagement – Is it desirable? Is it systemic? Does it reflect cultural aspirations? Value – Is there demand? Can we create demand? What are the revenue opportunities? Provocation (Innovation but it can be too much or go to far. Product Management includes facets of engineering, design, and marketing. PM has a history in engineering and the function is determined by the team. Design this is a new process through ambiguity. Using creativity. The explosion of devices and mobile apps is a result of the explosion of design and creativity. Design is tactical and strategic. These need to be paired and merged. A good product manager includes the ability to be a good story teller of an optimistic future. Ability to make sense of signals from people and the market. Be interested in talking to people or a passion for listening and learning about people. It’s about if you are curious enough and curiosity about other disciplines. Affable and the ability to work with others and drive consensus through charisma. Key areas are design to help students: succeed in college, tell their story and get a job. Contextual Research – Identify a research focus, participants, and watch the participants as they work, live, and play. Observe real behavior. Synthesis and Sensemaking – “Marinate in the data!” Spending a lot of time with the information. Yes, it’s super time-consuming but box it in around 2 weeks to come to an agreement on consolidating the feedback and behaviors. Behavioral Insight – Ask the “why”. An insight is a a provocative statements about human behavior, framed as universal truths. Make an inferential leap. Value Proposition – What is the promise? What is the value? This provides the structure. Tell and show a story of the problem state. Provoke the “what if” questions. Frame the new capability as a statement of value provided to a person. Feature Definition – Develop user stories. What does it look like, how will it function. Work with design to produce wireframes, comps, assets, etc. Chunk the ideal solution state into a series of smaller feature initiatives. Create scenarios and high-level flow diagrams and ideal solution state. Launch – Prior to launch, identify usage behavior that will indicate if your value prop is being realized. Create a regular communication mechanism for disseminating results. Try to understand relationship between design and behavior. Communication – Identify a strategic method for communicating value. Ensure method includes an action that supports the value proposition. Disseminate a test to a significant population of users. Community Feedback – Ensure that you receive all communication that in any way that touches an end-user. Go make something, and make it great!